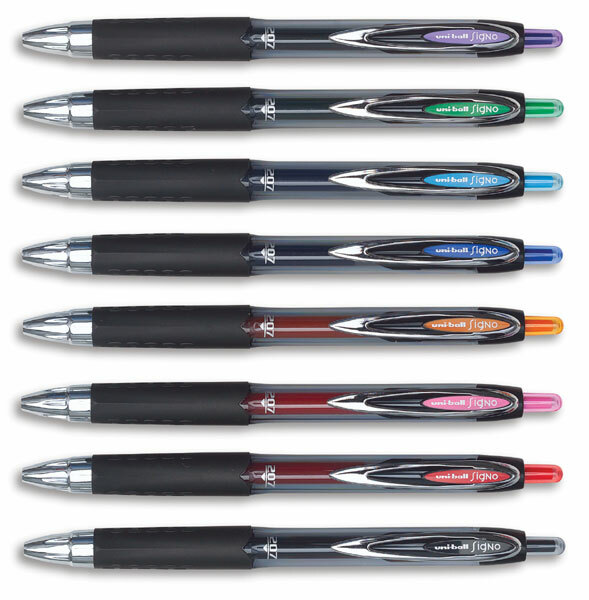 Uni-Ball's improved Uni-glide pigmented gel ink formula provides a consistent, clean writeout. The fade-resistant, water-resistant, acid-free ink is great for documenting and record keeping. A textured grip provides comfort and control. 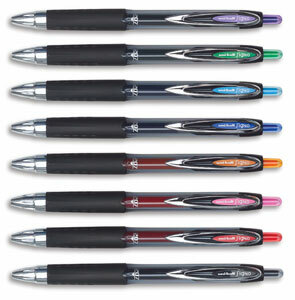 These pens are retractable with a sturdy metal clip and translucent barrel that allows you to monitor ink supply. Because color pigments are absorbed into the paper fibers, ink cannot be altered on checks, eliminating the threat of check fraud due to check washing. Set of 8 — This package contains one each of the colors Light Blue, Orange, Green, Pink, Purple, Red, Blue, and Black. ® Uni-Ball is a registered trademark.™ 207 is a trademark.